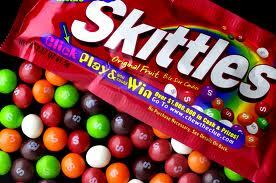 Almost everyone likes Skittles. Even if they don’t, they do know what they are. In nail blog land, skittles means putting different color polishes on each of your nails. It also can mean using the same polish as an overlay and different base coats or, vice versa. This time, I’m going to show you different base coats to showcase Cult Nail’s ‘Hypnotize Me’ as an overlay. ‘Hypnotize Me’ is a jelly polish with a light, translucent green base. Then it is loaded up with a ton of green and turquoise glitter. First, is ‘Hypnotize Me’; Sally Hansen’s Nailgrowth Miracle ‘Gentle Blossom’; Sally Hansen’s Xtreme Wear ‘Black Out’; Cosmetic Arts no name Baby Blue; and last, Artmatic’s #37 white creme. This is ‘Hypnotize Me’ alone on my thumb. This is 2 coats, no top coat. This is ‘Vintage Velvet’ from Finger Paint’s new Fall collection. Pretty wicked together. Reminds me of the ocean. I have 2 coats of ‘Vintage Velvet’ and 2 coats of ‘Hypnotize Me.’ I don’t have on any top coat. ‘Hypnotize Me’ is shiny enough without one. Cult Nails can be purchased from their website. Finger Paints are found at Sally’s. It might seem odd, but I enjoyed wearing my skittles for the day. I like the grape flavored Skittles. Which one do you like? How are you going to wear your ‘Hypnotize Me’?